But, to many, the biggest surprise was the weak showing of the Swiss People’s Party, the SVP. For two decades, the proportion of the electorate voting for the anti-immigration, anti-European party had steadily increased. With a number of controversial popular initiatives and xenophobic campaigns (most famously the ‘black sheep‘ campaign, which the UN denounced as racist), the party mobilized voters and more than doubled its percentage between 1991 and 2007. In the run-up to this year’s elections, the SVP had once again dominated the campaign environment and confidently pledged to increase its share of votes to 30 percent. Falling almost 5 percent short of this promise, it has now clearly been put in its place. A number of prominent SVP figures, including billionaire Christoph Blocher, who had been instrumental to the party’s rise and drive to the right over the past decade, have not managed to secure a seat in the upper chamber in the first ballot. This is symptomatic of a more general problem the People’s Party faces: it is rarely able or willing to put forward candidates with majority appeal. The party’s strength lies in mobilizing through fear (of immigration, and of change in general) — rather than through charismatic personalities or detailed policies. With the new distribution of power among the main parties, much will depend on exactly how the center parties will work together. The ‘new center’, though stronger in number, is more fragmented than ever in its political agenda. This means alliances will have to be built around issues, not politics. After nine years as Foreign Minister, Micheline Calmy-Rey has announced that she will step down before the new government is formed. The Social Democrat has been a colorful and not always uncontroversial figure on the Swiss political stage. With her vision of ‘active neutrality’, she pushed for an expansion of civilian peace-building, including more involvement in conflict mediation and support of international humanitarian law. But these attempts to maximize Swiss influence on the world stage did not go down well with the SVP, which has sharply criticized active involvement in conflict mediation policy-making, arguing that this constitutes a violation of Swiss neutrality. Maintaining a coherent — and therefore effective — foreign policy will remain challenging for the new government. Switzerland’s priorities and interests are continually being redefined within the domestic process, where they are heavily influenced by the private interests of the business and economic communities. The parties that make up the government have not been able to agree on any of the country’s key foreign policy issues, and the government lacks a prime minister with the authority to set major policy guidelines. Ultimately, the population will have to vote directly on the important decisions. 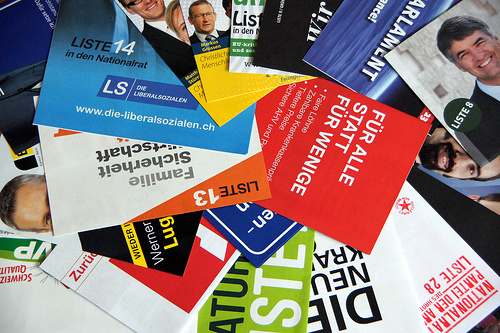 Referenda are a common feature of Swiss politics; since 1992, there have been eight national votes regarding EU relations alone. All eyes are now focused on 14 December, when the new Federal Assembly elects the seven-member executive council that constitutes the government. Under an informal rule, the major parties apportion seats in the Federal Council according to their relative political strength in parliament. The interpretation of the rule varies, however, depending on each party’s interests. Defenders of an arithmetic interpretation of the rule – the so-called ‘ magic formula’ – say that the three strongest parties are entitled to two seats each, with the remaining seat going to party number four. Others give more weight to the personalities involved, pointing out that the Swiss system only works if team players are elected. Two factors further complicate matters: first, the election process is staged, which means that parties whose seats are voted on later in the process will have to trust that the other parties will support their respective representative. Second, because the SVP expelled sitting Federal Councilor Eveline Widmer-Schlumpf from its party after her election in 2008 (which led to the formation of the Conservative Democrats), she is not a member of one of the four strongest parties. The popular Finance Minister’s re-election would mess with the arithmetic interpretation of the magic formula – and force the assembly to either take away a seat from the Liberals, or deny the SVP, Switzerland’s biggest party, the ‘right’ to a second seat in the government. This, SVP president Toni Brunner claims, would push the party into opposition. Although this is old rhetoric, it seems more valid these days. So has the old, unique Swiss model of governing run its course? Will it evolve into the more common coalition-government versus opposition model? If so, the SVP, the ‘People’s Party’, would be endangering perhaps the most important of all the Swiss characteristics it so vehemently defends.